Hydraulic swing beam shear (fixed angle shear) is the first-generation hydraulic shearing machine, while hydraulic guillotine shear (variable angle shear) belongs to the second generation. At present, many of the world-famous manufacturer only produce hydraulic guillotine shear, and hydraulic swing beam shear has been fall into disuse. – Do linear vertical motion. -100% hydraulic pressure acting on cutting edge. – All four cutting edge can be used. – Can only cut in specific angle whatever the thickness of the plate. – Adjustable cutting angle, different cutting angles are applied for cutting plate with different thickness. – Can also increase the shear angle to increase the shear force. 5 Lubrication point Bevel gears are heavily worn and require frequent lubrication to increase service life. Most use self-lubricating spherical plain bearings, basically don’t need to manually lubricate. 6 Blade carrier return device Nitrogen return cylinder, easy to leak, often need to repair. The bladder-type accumulator returns are stable and reliable. 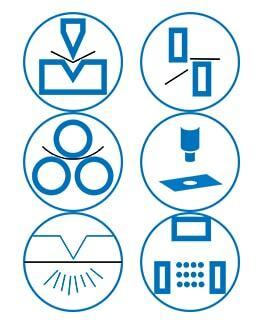 7 Use range Ordinary small and medium workpieces, common requirements for the cutting surface. Large and medium-sized ultra-long sheet shear, require high precision for the cutting surface. – Stepless speed regulation, low noise, spring retraction and buffer function. 9 Fuel tank (optional) If ordinary plates are not handled, the long time, the easier to rust, causing the hydraulic parts to block and wear. The overall plating treatment, no rust, not easy to react with the oil. 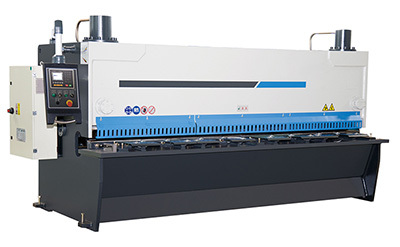 Take 16*3200 hydraulic swing beam plate shears and hydraulic guillotine shears for example, the designed edge gap values are less than 6cmm, but the bearing connection clearance between the swing beam shearing machine arm and swing body cannot be eliminated. Clearance’s accumulation of shear accuracy errors are generally more than 10mm, while the rear guide rail of blade holder on guillotine shears are supported by four big bearings, the front guide rails are pressed by two bearings with compression springs behind them, which make it no clearance between guide rail. The accumulated accuracy of clearance keeps at 4cmm. Therefore, the shear material is smoother and burr-free. The blade holder body of the swing beam shears is itself curved. It is contacted with arc point to ensure the straightness of the shearing material. However, the blade of guillotine shears does vertical linear motion relative to the lower blade edge to ensure small shear sheet distortion and accurate straightness. Since the frame force and blade of swing beam shears are not in the same line and far away, the blade is easy to produce fatigue and deformation after long working hours. The cutter back-off problem is very serious which causing the cut material to be cut with burrs. However, for guillotine shears, the cylinder, knife, blade in the same line and make movement perpendicular to the lower edge, it’s very difficult to get deformation. For guillotine shears, by adjusting the two engineering cylinder up and down series of closed chamber oil rapid adjustment to achieve the angle adjustment: Shear angle is large, shear capacity increases, shear angle decreases, shear speed up, which has the advantage of saving power and working hours as well as reducing curvature of sheet effectively. 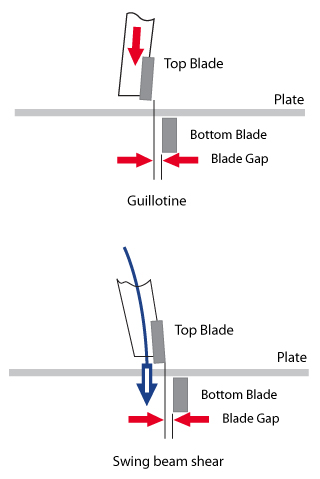 Because the swing beam shears blade point is curved movement during the work, so can only use the diamond blade with two sides knife-edge; while guillotine shears blade do a straight line movement perpendicular to the lower edge, so directly use a rectangular blade with four edges, therefore the service life of the blade increased by 1 times. Cut sheet with the diamond blade is easy to cause sheet twist, the more narrow of the cut-off sheet, the more serious. However, rectangular blades can avoid this defect. The built-in cylinder semi-circular block used in the swing beam shears is difficult to lubricate and difficult to repair. 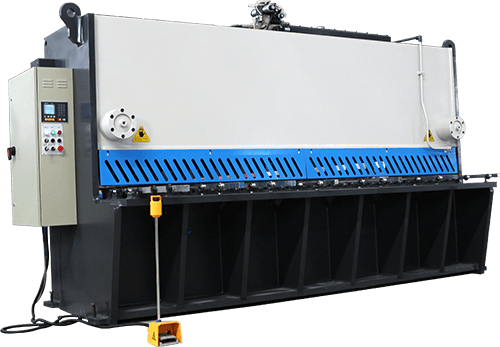 While the upper and lower cylinder of guillotine shear is filled with oil and no need additional lubrication, which will greatly improves the service life. The shearing angle of swing beam shearing machine is fixed and cannot be adjusted. The efficiency of the shearing thin sheet and the thick plate is the same, which means cut the sheet wasting a lot of power resources and working hours. For example, the power of one QC12K-35*2500 hydraulic shears is 55KW, cut 35mm thick sheet 4 times/min. As the shear angle cannot be adjusted, the time still is 4 minutes for cutting 10mm plate. In order to reduce the deformation of the rack and reduce the power of the machine, the shearing angle of the swing beam shears usually takes the maximum value. However, the large shearing angle will cause a large bending deformation of the workpiece when shearing the thin sheet. The connecting clearance between the swing arm and swing beam could not be eliminated. There are two types of clearance on swing beam shear. One is blade clearance, the other is connecting clearance between the swing arm and swing beam. The total amount for such two clearances is above 0.1mm. The cutting beam is guided between roller guides. At the rear of the cutting beam, there are two sets of upper and lower roller guides located at each end of the beam. Two spring-loaded rollers located at the front of the shear apply pressure to the cutting beam, forcing it against the back-roller guides. The bearings of the upper roller guides at the back of the cutting beam are mounted on an eccentric shaft. Rotating this shaft causes the cutting beam to tilt, thus providing proper blade clearance to the shearing blades. There is not any clearance between front roller guide and back roller guide. The total clearance is only the blade clearance. The clearance is within 0.05mm. Thus the cutting surface on work-piece could be smoother, without bur. For swing beam shear, the cutting beam (blade beam) is with arc/ cambered shape, so the cutting contrail/track on the material side cutting surface is of arc/chamber shape. The linearity on cutting piece is also not good. Swing beam shear above 4M length, there are big retract in the center of the blade beam, so big burs in the center part of the cutting pieces. This status is unavoidable for swing beam shear. For guillotine shear, the blade beam with good linearity, the cutting way is straight cutting, the cutting linearity on the product is much better than swing beam shear. For swing beam shear, since the shearing angle is fixed, when the material thickness is less than 25mm, the workpiece after cutting is twisted (with the shape of fried dough twist). The narrower the workpiece, the more distortion will it has. For guillotine shear, through control the oil filling amount of upper and lower cavity of both cylinders, the shearing angle could be adjusted easily. Since the shearing angle is adjustable (with step-less adjustment), so you can select the proper angle for different thickness, thus the cutting piece will not get distorted. When the shearing angle gets bigger, the cutting force is stronger, the cutting thickness gets bigger, the shear can cut thick thickness material easily. For swing beam shear, Since the moving track of the blade is with an arc shape, so only rhombic/diamond shape blade could be used. Only two cutting edges is available. Cutting with the rhombic blade will also make the cutting piece to be distorted/twisted. The narrower the cutting piece, the more distortion on the cutting piece. So the cutting life of the blade is doubled. Straight cutting by rectangular blade can cut a much narrower workpiece with very few distortions on the cutting piece. For swing beam shear, since the angle is fixed, so speed is fixed. For guillotine type shear, the shearing angle on guillotine type shear is adjustable. When the shearing angle gets bigger, the cutting force gets bigger. When the shearing angle gets smaller, the cutting speed gets quicker. The cutting stroke is also adjustable on guillotine shear, thus the speed could be increased quite a lot when cutting short length piece. For swing beam shear, the adjustment on blade clearance is very difficult. The adjustment is not continuous and with many steps, it is not accurate adjustment. For guillotine type shear, the step-less adjustment on blade clearance is done by hand-wheel and with gauge display. With an intuitionistic view and easier adjustment for the operator. For swing beam shear, It is very difficult to fill lubricate into the inbuilt semi-circle block of the hydraulic cylinder, the cylinder is very difficult to be disassembled for maintenance. For guillotine type shear, oil keeps filling in the upper and lower cavity of the cylinder, lubrication is no need, and thus the life of cylinder is improved. For swing beam shear, the loading force on the frame body is not even/ symmetrical/ well-proportioned. Since the force loading point and the blade edge is not in the same beeline, and the distance between each other is far away, so blade beam is easily getting weak and distorted after the longtime running. Thus the retract in the center of the blade beam will get bigger and bigger, so bigger and bigger burs in the center part of the cutting pieces will appear. For guillotine type shear, since the cylinder, blade beam and blade edge are in one beeline and with linear movement, so machine frame and blade frame not easily get distorted. Therefore, the machine has better stability. And the cutting piece is with very few burs because not any retract on the blade beam. For swing beam shear, due to the limit/restrict of the blade beam and back gauge structure, when cutting piece width is smaller than 20mm, the back gauge is useless (could not be used). For guillotine type shear, even when the cutting piece width is 5mm, the back gauge could be used for sheet positioning.